You may have read a few days ago that Atelier Rorona Plus had been rated by the Australian Classifications Board, basically meaning the game was a 99% possibility. 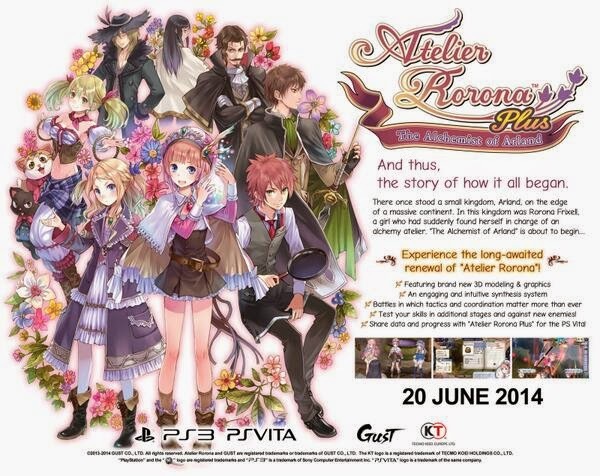 Following this news, Tecmo Koei have officially announced the Western release of Atelier Rorona Plus: the Alchemist of Arland for June 20th 2014. The new version will include new 3D modeling and graphics, improved synthesis system and added chapters featuring Totori and Meruru from previous Atelier games. The game will be available physically on PS3 and digitally PS Vita. If you're interested in the physical PS3 copy, you can pre-order on Amazon .